Steel-Flex Puncture Resistant Insoles are an exciting new product offering both comfort and puncture resistance with a fully encapsulated, flexible Steel-Flex steel midsole. When you think of how they can be applied to wading boots, it’s a natural fit for some anglers. -They’re designed to fit into most types of work boots and shoes. 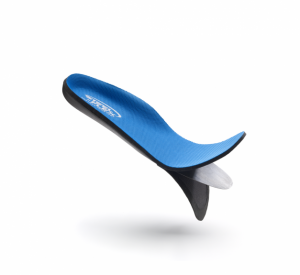 -An insole consists of a heel cup and longitudinal arch support for improved foot stability. -They help align the skeletal structure to reduce foot, leg and lower back fatigue. These things cost @ $30, and that may be an option worth offering customers who tend to fish where they can step on nasty things, those who might want to revitalize the fit and feel of some old wading boots, or those who want to make less expensive boots feel and wear better and safer.